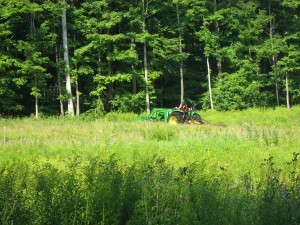 For forty-five years research by Williams faculty, visiting scientists and students in such disciplines as biology, chemistry, environmental science, and geosciences has taken advantage of several unique aspects of Hopkins Forest: ease of access; variety of habitats and terrain; on-site wet and dry laboratories; web-served real-time meteorological data and long-term records of vegetation change and land-use; long-term hydrology, meteorology and water chemistry datasets; and specialized research structures such as the canopy walkway. Hopkins Forest was selected as a site for a continental scale study of the causes of geographic distribution limits in plants using lyre-leaved rock-cress (Arabidopsis lyrata var. lyrata). In August 2017, graduate students Antoine Perrier and Dario Sanchez Castro of the University of Basel, Switzerland set up their field nursery in the meadow south of the Rosenburg Center to grow 1400 potted specimens of A. lyatra of different geographic stock to test their growth response at this, the northern extent of the species range. Other North American sites for this study were established in upstate New York, central Virginia and central North Carolina. The study — headed up by Dr. Yvonne Willi with support from the Swiss National Science Foundation — will continue into 2018. In the mid-1930’s, the U.S. Forest Service established a system of 1/4 acre permanent plots where they identified and measured all forest vegetation more than 0.5″ in diameter, as well as the shrubs and the herbaceous layer. Since then, the number of plots has increased to over 400 plots and the original plots have been re-measured periodically. 2010 marked the start of the fourth iteration of surveys which concluded in summer 2011. The land-use history of most areas in the HMF is well known, having been a principal interest of Landscape Historian and Biologist Henry Art. Link to HMF Vegetation Database HERE. Temperature, relative humidity, precipitation, wind speed and direction and solar radiation are monitored at several weather stations in the HMF [view weather data]. Water discharge is measured continuously at weirs (small dams) on the South Branch and main stem of Birch Brook. Precipitation chemistry is monitored in samples collected near the weather station field and the chemistry of Birch Brook is monitored periodically. Contact Professor David Dethier for information about the meteorological, hydrological, and biogeochemical monitoring in the forest or the Environmental Analysis Lab. 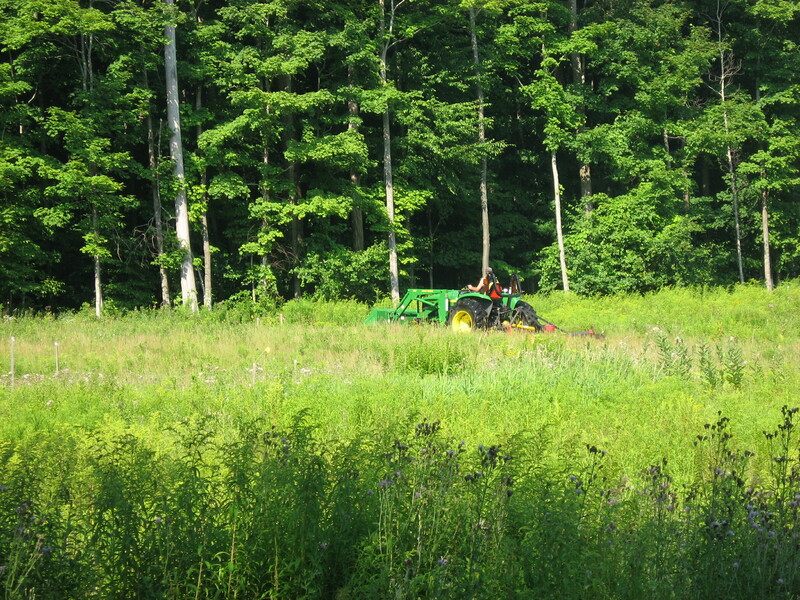 The focus of this study, overseen by Joan Edwards, is to assess the impact of both the timing and frequency of mowing on floral production (flower-scape) and pollinator activity. We are using sixteen plots divided into four blocks (with individual treatments) to assess the effects of early (late-July) annual, early biennial, late (late-October) annual and late biennial mowing. After a regime of annual mowing and collecting some baseline data, we started treatments in summer 2013 and have continued with the mowing regimens each summer since. 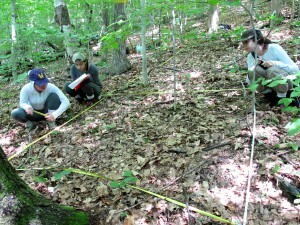 Each autumn students and faculty gather data on the plots. In 2017, in addition to the floristic surveys, we again used cameras, one per plot throughout the study site, to record visits of insect pollinators. They were each fixed on one prominent inflorescence of Solidago rugosa (wrinkle-leaved goldenrod), a plant that occurs in every plot. Julie Jung’s 2015 honors thesis, entitled, “The influence of land management practices on the abundance and diversity of fall-blooming Asteraceae and their pollinators” presents the initial findings from this study. 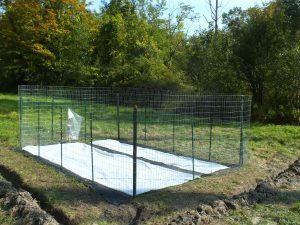 Joan Edwards’ study of the population dynamics of the invasive plant, garlic mustard (Alliaria petiolata), continued into 2016. 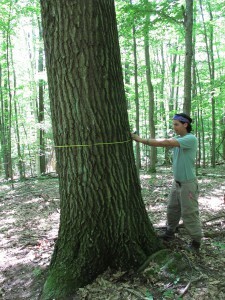 Student assistants continued collecting data on established plots in three different areas in Hopkins Forest. By analyzing these data over a number of years, Dr. Edwards is gaining insight into garlic mustard’s success in forests of different ages, its rate of invasion, and its effects on native flora. Manuel Morales in the Biology Department, Hopkins Forest continued his study of ant (Formica sp.) and tree hopper (Publilia sp.) mutualism in goldenrod (Solidago altissima) fields. Experiments conducted in several fields during the summer of 2017. Past experiments have tested the effect of fertilization of S. altissima on the their Publilia colonies. More on Dr. Morales’ research. 2017 marked the sixteenth season of banding Northern Saw-whet Owls (NSWO) during their fall migration at Hopkins Forest. 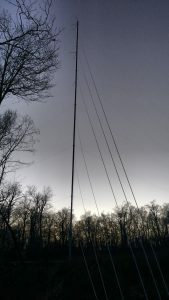 The station operated on 35 evenings from October 1st to November 17th–using an audio-lure and mist nets to capture and band these small, migratory owls. The station captured 126, mostly female, NSWOs during this period. Of these captures, nine had been previously banded at other stations. 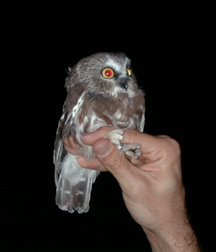 In addition, several owls that we had banded in previous years were recaptured at various stations in the Eastern U.S. Continued recoveries of HMF banded owls at other stations will yield additional information on their migration routes and timing, growth, survivorship and molt progressions. Come visit our banding season in the fall. Undergraduates at Williams have undertaken numerous research projects, including honors thesis research, on a variety of topics over the past thirty years. Other opportunities for undergraduates include research assistantships, independent studies, Winter Study projects and summer employment. Although funded positions are generally reserved for Williams College students, consideration would be given to individuals from other areas where feasible. Check the Summer Opportunities page if you might be interested in working at Hopkins Forest this summer. Persons interested in undertaking research or environmental monitoring in Hopkins Forest should submit a Research Proposal Form.